This definitely looks like a criminal lineup in my overgrown garden. I’ve been organising my shoe collection now we’ve moved house and while stacking box upon box, I realised just how many pairs of wedged boots I actually own. It’s no secret that I am a wedge fan across all seasons, as I’m ridiculously clumsy and have Bambi-like ankles, but you can definitely say and see that I have a type. 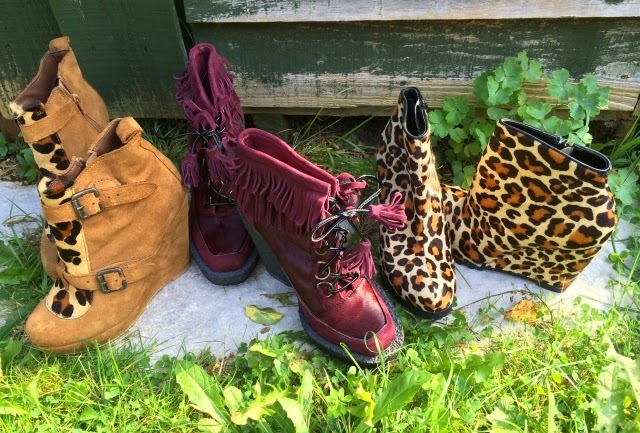 I like my mine animal-printed, made in suede or pony skin and covered in heavy buckles, or even better, fringing. One thing’s for sure they have to be bold, brash and completely garish, otherwise I’m just not interested. The following shoes have been sentenced to a life sentence of being worn throughout winter. I love your taste in shoes!